Gina was shown limitedly as a youngster, I decided the show ring wasnt the place for her to be and so I trained her as a working gundog, which she took to instantly and she competed at a few working spaniel tests/assessments. 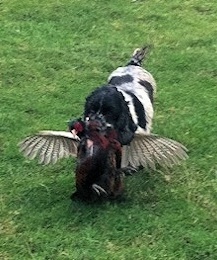 Gina was observant and a lively character, she loved to go out in all weathers and proved herself as a working gundog. Gina willingly retrieved any size game bird - from quail to pheasant. Very much a dual purpose cocker spaniel. Gina competed at a few working spaniel tests. © 2012-2018 Pearkim Cocker Spaniels. All Rights Reserved.